Why Are China and Russia Buying Gold As Fast As Possible? Why are two of the world’s superpowers gobbling up gold so quickly, and what does it signal to Americans about their own savings? 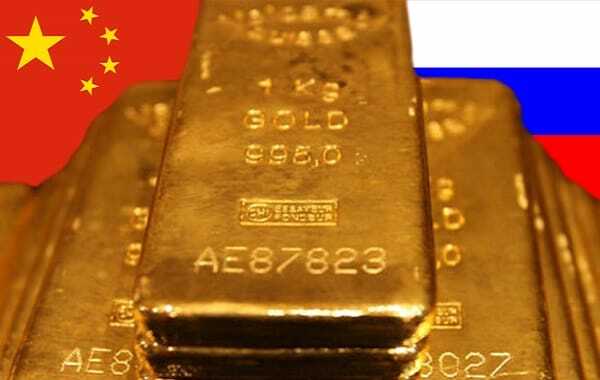 The primary motivation behind China and Russia’s mission to rapidly increase their gold reserves is actually quite simple: both countries want to reduce, and ultimately eliminate, their dependence on the U.S. dollar. However, the underlying objectives that each country wishes to accomplish by doing so are slightly different. Russia is trying to release itself from the reigns of financial sanctions coming from Washington, according to a report in Sputnik News. China, on the other hand, is hoping to bolster its own currency, the yuan, with the long-term goal of establishing it as a global reserve currency to compete with the dollar, MarketWatch reports. Although their motives differ slightly, the message behind China and Russia’s actions is the same. These countries don’t trust the stability of the dollar; they want to pave their own way to independence and supremacy for their own currencies; and they’re aiming to eventually topple the dollar’s dominance. Meanwhile, people around the world are growing more and more concerned about the global economic climate, which is causing them to purchase gold more fiercely than ever. So if both regular savings investors and international superpowers like China and Russia are buying gold to get away from the dollar and to avoid the effects of global volatility, how might that influence your own savings strategy? Clearly, this behavior tells us that the robustness and stability of gold is more important for average Americans than ever. And with the momentum that’s being created by China, Russia and smaller gold buyers around the world right now, could this be a rare opportunity for Americans to go along for the ride, so to speak, as these forces push gold to new highs? In other words, there are two big arguments for why this news suggests that this is an excellent time to get into gold. The first argument is that China and Russia’s gold buying, and the motives behind it, will almost certainly weaken the dollar. And the second argument is that all this gold buying is pouring gas on the already red hot bull market gold, which makes for a special opportunity that doesn’t present itself often. Furthermore, professionals believe that the buying activity that’s creating this phenomenon could grow even stronger in coming months. For Americans who still haven’t woken up to the incredible potential of gold, this news of China and Russia’s plan to assassinate the dollar would be terrifying. But for those who understand what’s really happening and how to act accordingly, this may be a rare opportunity to move at the right time.